Update 5 August: Boris Johnson has issued an instruction to the Fire Authority overruling their decision to reject the cuts, and saying he wants the body to authorise the revised plans by 16 September. 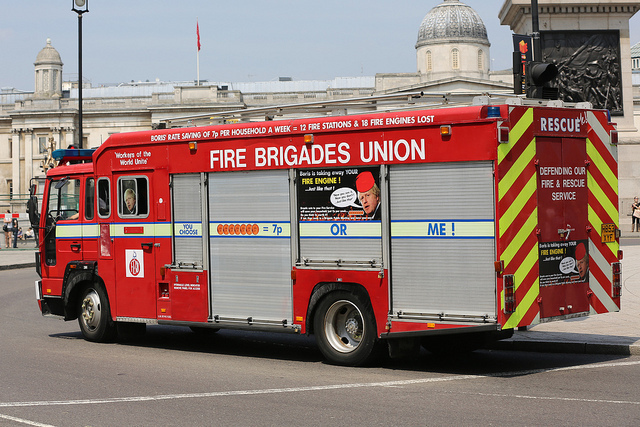 Original post: Boris Johnson appears to be on the verge of overruling London's Fire Authority (LFEPA) on fire station closures and other cuts for the second time. Last week, LFEPA voted to reject revised plans to re-organise the fire service. This would close 10 stations instead of 12 and keep two extra engines, at the expense of two specialist Fire Rescue Units and 30 fewer firefighters, reducing the number by a total of 552. This has happened before: in January, LFEPA rejected the original proposals but were overruled by the Mayor to force through a consultation on the cuts. 94% of respondents to that consultation were against the cuts*, which resulted in said revisions. However, the Labour, Lib Dem and Green members of LFEPA are implacably opposed to any cuts to the fire service and of course rejected them. I am not minded to provide additional funding to the London Fire and Emergency Planning Authority (LFEPA) for 2014-15. I have set out my intentions as to the level of resources LFEPA should receive for 2014-15 not just on the basis of reductions in government grant but also on the basis of what level of frontline savings LFEPA can reasonably make without affecting public safety. This is interesting wording. It's not saying 'there's no more money available', but that he's 'not minded' to allocate any more. It's worth bearing in mind that the cuts had to be worked out in response to the fire brigade budget – which is set by the Mayor. Opposition parties say that if Boris scrapped his 7p-a-week council tax cut, that could fund the budget gap. We can't comment on whether this is accurate; the financial statements of all the public bodies under City Hall's umbrella are so complicated they make us want to weep. Boris Johnson has asked for LFEPA members' views; he also said at the last Mayor's Question Time that he would listen to "reasonable" suggestions about alternatives. But given that he also said he wouldn't listen to anything put forward by "scaremongering" politicians (i.e., anyone on the left) and has repeatedly rejected the council tax proposal – which we all know is the view that will be put forward by the majority of the LFEPA board — that doesn't leave much wiggle room. * Labour's Val Shawcross tweeted from last week's LFEPA meeting that the Conservative response to the '94% against' rate in the consultation, was that 99.7% of Londoners didn't respond at all. So there you go, London; according to the Tories, none of us could be arsed so they get to do what they like. Simon Harris at ITV London reported on LFEPA's vote last week and interviewed some of its members.